Unless you are a huge old movie fan, you probably know Joan Crawford as "Mommie Dearest" a wire-hanger wielding monster of a mother with giant shoulderpads. Well, for a few minutes, try to erase that image from your mind entirely because I'd like you to meet somebody. This is Lucielle LeSueur. In the 1920's when Lucielle went to Hollywood, MGM studios held a nationwide contest to find a new name for their new star. The name "Joan Crawford" was chosen. (she always thought it sounded like "crawfish") The name Joan Crawford seems to fit that image we are familiar with today- it imbues control freak and rigidity. But from the moment she was rechristened until the early 1940's, Joan Crawford was really Lucielle LeSueur. She was softer, beautiful and feminine. In her movies, she conveys the quinetessential flapper/working girl, often getting the short end of the stick and working her way to happiness. She was energetic, and believable as a spunky human being. Most of the available DVDs starring Joan Crawford represent her "tough broad" films like Mildred Pierce or her later horror movies like Strait Jacket. But two of her really, really good old movies are on DVD- Rain and Sadie McKee. Rain is the story of a prostitute who is taunted by a religious zealot who wants to save her, and Sadie McKee is one of the working-girl makes good stories (the song "All I do is dream of you" is repeated numerous times in this film, and I guarantee you'll be humming it in your head for weeks... and that's a good thing!) I highly recommend renting both of these films. But before you put them in the DVD player, try to clear your mind of the iconic Crawford and open your heart to Lucille LeSueur. I'm sure you'll be impressed by her talent and beauty--- and you will probably agree with me-- that whoever told Joan Crawford "You'd look absolutely divine if you just wore football player shoulder pads, drew in huge dark eyebrows and made your lips look like a rectangle!" should have been fired on the spot. 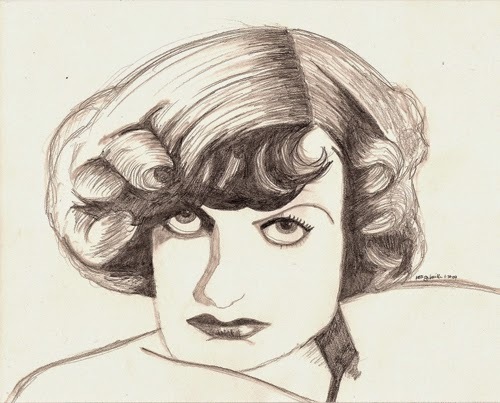 You totally captured Joan's vibe in that sketch! BTW, I was looking at your Etsy store...I just LOVE, LOVE, LOVE the "Astaireing Contest"! Hi there -- I've really enjoyed looking at all your sketches and reading the posts that go with them, but this sketch in particular is outstanding! It really does capture young Joan so perfectly!